The lengths we bloggers will go to get recognized. I'm currently trying to tango with the cyber gremlins again, and feel like a blind dancer doing steps on a floor full of potholes. I am attempting to register my blog with Technorati to see if I can attract more readers, but the usual promise of "a few easy steps" is turning into more automated messages that politely veil the disdain that the evil computer geniuses must feel for poor, semi-cyber illiterate bloggers like me. The essence of the last message was something like this, "You idiot! We told you to copy the code into the body of your next post! How do you expect us to do our stuff when you can't even follow directions?" I wouldn't want you to think that this post is totally about appeasing some cyber robot (even though it is), so here is a link to a series of close-call shots taken at a fire scene in North Carolina. Yes, the firefighter's gear is flaming. Yes, these guys are very thankful that they lived to see another Christmas. Yes, firefighting is nuts sometimes. I'm part of a team of instructors for what's called the Flashover Recognition and Survival Course, put on by the Ontario Fire College. 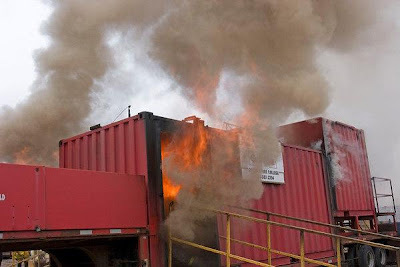 It gives the students a chance to study fire behaviour in a (usually) calm, controlled environment, and learn to recognize warning signs that flashover is imminent. It's one of the best courses we teach. Here is a shot from a course we did in Moosonee a few years ago. For the record, there aren't supposed to be flames coming out the door like that (I said usually calm and controlled). If you want to see more shots by Paul Lantz, click here.